These Terms and Conditions govern the supply of Products sold by G E Little Group - G E Little Radiator Covers & Wine Racks ("we" and "us") to the customer ("you"). These constitute the entire and only agreement between us in relation thereto. These Terms and Conditions also govern access to and use of this web site. By using this web site you agree to accept these Terms and Conditions. If you do not wish to accept them, please do not use this web site. Our Registered office & contact mailing address is: G E Little Group, Woodridge House, 7 Low Road, Little Stukeley, Huntingdon, Cambs PE28 4BA. You may also contact us by fax on 0207 100 1211, by telephone on 01480 450917 or by email at sales@gelittlegroup.co.uk. Please note that this is our Registered Office only and not our trading address/factory & warehouse which is on a different site. The product you ordered being unavailable, and our being unable to fulfil your order. Our inability to obtain authorisation for your payment - orders are only processed on receipt of cleared funds. Your failure to meet the eligibility to order criteria set out below. Where your order has been accepted via a card payment over the internet (which is processed in full at time of ordering - we do not accept any orders without full payment at point of ordering) and we decide for any reason we cannot accept your order, we will notify you via email and refund your monies in full back to the card used for the transaction. Any contract to supply the said Products will become void and we will not be liable to you for any consequential losses of any kind. The customer must be legally entitled to use the card on which they make the transaction. The customer is required to input correct address details including postcode and country. The order may be declined after processing should the delivery address not be traceable or if there is a mismatch between the delivery address, postcode, country or area of delivery. We do provide customers with a "Voucher Code" to obtain replacement parts etc. We reserve the right to decline an order, after processing, should we suspect that the Voucher Code has been incorrectly or fraudulently used or applied. Where the law requires a minimum age limit for the purchase of specific Products (eg: adhesives), you confirm that you are over the required age limit and that delivery will be accepted by a person over the required age limit. We reserve the right to cancel your order if we reasonably believe you are not legally entitled to order certain Products. We will arrange delivery of the products you order to the invoice/payment address. Please note that you are responsible for ensuring that the correct address and postcode is given when placing the order as we cannot be held responsible for any losses or other expenses incurred as a result of mis-delivery owing to incorrect addresses and postcodes. Furthermore, instances where Products have already left via carrier and the address or postcode is found to be incorrect, may lead to the Products having to be re-routed to a different depot. Such routing requests or failed deliveries incur separate charges for which you will be liable if this is due to an incorrect address or postcode being given when ordering. Dispatch times given are an estimate and please bear in mind that public holidays and any advertised closure period will impact on this estimated lead time as will order quantities during the busy Oct-Dec period. 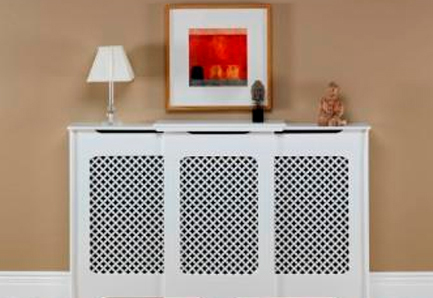 It is also possible for orders for plain or primed UK manufactured or made to measure covers to be dispatched earlier than the estimated times and orders for fully finished UK ready made or made to measure cabinets to take longer than the estimated average (depending on the mix of orders at any given time). The time for delivery is not of the essence to the contract between us. You can find detailed delivery info here which will also include details of any forthcoming closure period and detailed info on production scheduling and estimated dispatch times and this information is kept updated regularly during busy periods. Please ensure that you have read this information and are happy with this before proceeding to order. A valid signature will be required on delivery. Upon delivery of the Products to you, the Products shall be at your risk. In spite of delivery having been made, title in the Products shall not pass to you until you have paid the price for the Products in full and no other sums whatsoever shall be due to us from you. Until title in the Products passes from us, you shall hold the Products on our behalf to our order and shall store the Products at your own cost separately from all other goods in your possession and marked in such a way that they are clearly identified as our property. When your order is received please check the condition of the package. If there is any visible damage to the packaging please sign the delivery note making sure you note on the ticket the visible external damage. In the unlikely event that the Products themselves are very obviously damaged you may refuse the delivery but please ensure that the delivery note is signed to say that this is the reason for the return. You must inspect the Products as soon after delivery as is practicable and notify us as soon as possible of any shortages, defects in or damages to the Products or of any other complaint in respect of them within 14 days from the date the Products are delivered. When your Products are dispatched we use a next working day service for most items in an attempt to provide you with more certainty of the actual delivery date (than on a standard 3-5 day service). You will be automatically emailed from our server to inform you of the day your item(s) are leaving via carrier and the anticipated actual day of arrival (this may be sent on the actual dispatch date but no earlier than the previous day). We are unable to telephone to advise of dispatch or to organise deliveries. We are unable to specify actual delivery times or arrange Saturday deliveries and we are also unable to arrange deliveries for specific days. If you are likely to be away from home around the time delivery is anticipated (or at any time between ordering and anticipated delivery), please ensure that you advise us by email after placing your order and we will ensure that no products are despatched to you for the time you are away. Please note that due to restricted space, we are unable to store orders for made to measure covers and these must be dispatched as soon as they are complete. Therefore for made to measure orders in particular we must be informed at the time of ordering if you are likely to be away so that we can alter the manufacturing schedule accordingly. Please bear in mind when specifying your address for delivery that deliveries are only made during working hours and days (Monday to Friday excluding statutory holidays). The next working day service is NOT GUARANTEED and therefore we would not recommend that customers specifically book time off work or stay at home specifically awaiting delivery. In the event that you have received a formal dispatch notification and nobody will be at home to take that delivery, you may leave a note to request the driver to leave the delivery with a specific neighbour (which the carriers will routinely attempt if nobody is at home to take the delivery). You may also request it be left in a specified safe and dry place but as our deliveries do require a signature we cannot guarantee that the driver would be willing to do this. If this is also not possible then the driver will leave a card with contact details on in order that you may re-arrange delivery on a day to suit or you may arrange to collect the Products from their local depot, should this prove more convenient for you. In the event that the carriers have unsuccessfully attempted delivery and not received contact to re-arrange delivery or if the carriers are asked to store the Products for more than a few days by the customer then the Products will be returned to ourselves. The Products will then be kept pending payment of an additional delivery charge for a new delivery. Any refunds made in such instances will be made less the carriage return fees. We are unable to re-deliver free of charge as we already subsidise delivery charges and, in addition, we are charged for each failed delivery attempt. Therefore you will be liable for the carriage return costs of £25 on any orders returned to us after a failed delivery. Please note that the third party carrier companies we utilise do not guarantee their next day delivery service although the majority of our Products will arrive the next day. Next working day does not apply to certain areas of the UK i.e. Scotland/Scilly/Isle of Wight. We cannot be held responsible for any losses or expenses occurred as a result of the failure of delivery on the day estimated by us. We are unable to guarantee that the driver will be willing to deliver the Products to anywhere other than a ground floor location or to leave without obtaining a signature.The drivers do have discretion to leave parcels without signature but this must not be relied upon as this is discretionary only. We are unable to recall a delivery once it has left our premises with the carriers and also unable to pass delivery instructions to the carriers once the Products have left our premises and any re-delivery arrangements will be the responsibility of the customer to arrange direct with the carriers. All our dispatches are collected at 7.30am daily by the carriers from our warehouse/factory location (order dispatches are usually sent at least the evening prior to dispatch). All dispatches are therefore labelled, consigned, palletised and shrink-wrapped ready for carrier collection by the preceding evening. Any request to amend delivery details, order cancellations/amendments etc or delivery instructions etc must be received at our offices prior to 4pm (warehouse/factory closure time) on the day prior to dispatch. If you order a combination of ready made and made to measure Products, these will routinely be dispatched together on completion of the made to measure Products. If you require an earlier delivery of the ready made items then please let us know and we will arrange this. Please note that smaller items (e.g. hinges and mesh etc) may be sent via Royal Mail. While we endeavour to hold sufficient stock (excluding made to measure items) to meet all orders, if we have insufficient stock to supply or deliver the Products ordered and paid for by you we will inform you via email of the delay and at your request either hold the order on an “await stock” basis or refund you the price paid for such Products. For stock lines (ready made products), you may cancel your order by giving us notice of cancellation of order within the Cancellation Period (see below). Such notice may be given by mailing, faxing or emailing to the number or address set out in clause 2 of these Terms (“Contacting Us”) or on your invoice/receipt. We will acknowledge receipt of your cancellation and will refund the card account on which the Products were purchased when we receive the returned Products. The Products should be returned to us properly wrapped and protected. We regret that the return carriage must be at your cost. If we agree to collect the Products from you or if the Products are returned at our cost, we reserve the right to deduct the cost of return carriage from the refund to your card. The Cancellation Period is different for different Products. For most ready made Products the Cancellation Period ends on the expiry of the period of 14 days beginning with the day after the day on which the Product is delivered. For ready made radiator covers, the Cancellation Period ends on the expiry of the period of 14 days beginning with the day after the day on which the Product is delivered or as soon as you start to assemble/fit mesh to the Product, whichever is the earlier. For made to measure Products once manufacture has commenced the Cancellation Period ends and you are required to complete the contract. Normally manufacture is commenced immediately on receipt of order with the CNC programming however, provided the order has not been cut, we may, at our discretion, allow cancellation or alteration of the order details but we would need to levy a nominal charge to cover the costs of the CNC programming. We will advise on updated order progress and manufacturing only upon request. See also clause 12 “Returns Policy”. We shall have no liability to you for any failure or delay in supply or delivery or for any damage or defect to Products supplied or delivered hereunder that is caused by any event or circumstance beyond our reasonable control (including, without limitation, failure of the carrier, strikes, lockouts and other industrial disputes, manufacturing issues/machinery failure). We will not be liable to you for any consequential losses of any kind and the maximum limit of our indemnity will be the original purchase price of the Products. All web site design, text, graphics, the selection and arrangement thereof, and all software compilations, underlying source code and all other material on the site are the copyright of GE Little Radiator Covers & Wine Racks and its affiliates, or their content and technology providers and all rights are reserved. We grant permission for materials on this site to be copied and printed for the sole purpose of placing orders with us. Any other use of materials on this site is strictly prohibited unless the user has previously obtained written permission from us. All brand names, product names and titles used in this web site are trade marks or trade names of their respective holders. No permission is given in respect of the use of any of the above and moreover any such use may constitute an infringement of the holder’s rights. If you have any questions, we are here to help. Please contact us. We want you to be fully satisfied with your Products. If the Products you have chosen do not meet your approval we will be happy to make a refund or exchange. You will need to notify us within the Cancellation Period (see below) and arrange to return the Products at your expense by Recorded Delivery within 7 days from your notice. Such notice may be given by mailing, faxing or emailing to the number or address set out in clause 2 of these Terms (“Contacting Us”) or on your invoice/receipt. The Cancellation Period is different for different Products. For most ready made Products the Cancellation Period ends on the expiry of the period of 7 working days beginning with the day after the day on which the Product is delivered. For ready made radiator covers, the Cancellation Period ends on the expiry of the period of 7 working days beginning with the day after the day on which the Product is delivered or as soon as you start to assemble the Product, whichever is the earlier. For made to measure Products once manufacture has commenced the Cancellation Period ends and you are required to complete the contract. We will advise on updated order progress and manufacturing upon request. Please remember that any Products you wish to return must be in their original packaging, unused and not assembled so please ensure that you are happy with the Products before commencing assembly. You are responsible for ensuring that the Products are suitably re-packed prior to return. You must ensure that the Products are appropriately insured whilst in transit and that you obtain the return address from us in advance, returns need to be made to the warehouse address - RETURNS CANNOT BE ACCEPTED AT OUR REGISTERED OFFICE AS THIS IS ON A DIFFERENT SITE & IS INDEED JUST OUR REGISTERED OFFICE ADDRESS & NOT THE TRADING ADDRESS. You must also ensure that you include a copy of your original invoice or other identification in order to allow us to track the origins of the return. It will not be possible to process refunds without evidence of the sender. Due to the high cost of carriage forwarding to ourselves (£25 per item) and the lack of insurance in transit for carriage return items for account customers, we are unable to arrange the collection of Products on behalf of customers. If, under exceptional circumstances, we do agree to collect the Products, the carriage will be at your cost and will be deducted from your refund. Products that are refused on delivery will also be subject to the £25 carriage forwarding charge. If however Products are refused due to damage or because incorrect Products have been delivered then we will bear the cost of the carriage return. If, however, the delivery is refused and returned to us for any other reason then it will be assumed that you have consented to pay the carriage forwarding charge and this will be deducted from any refund due. Refunds will be made to the card used when ordering. If, on inspection, the Products are found not to be faulty or damaged then the refund will be subject to the carriage forwarding charge detailed above and this will be deducted from the refund. This does not affect your statutory rights as a consumer. We strictly comply with the Consumer Protection (Distance Selling) Regulations 2000. We cannot accept items for a refund or exchange if they have been damaged after delivery or if the item has been custom made for you, such as made-to-measure radiator covers. It is essential that any damage on delivery is reported to us PRIOR TO ASSEMBLY. We will be unable to accept claims for damage or returns for units that have already been assembled unless the unit proves to be faulty. We will at our own cost replace Products that are defective or damaged on delivery providing we are notified within 14 days of delivery. Consideration will be given to claims outside this period but each claim will be assessed on its own individual merits and you will be expected to have used your reasonable endeavours to ensure that the Products were checked as soon as reasonably practicable. We reserve the right to offer replacement parts and/or repairs as appropriate and may arrange the collection of Products for inspection or if required by the carrier in the event of the goods being signed for as damaged and a claim being made against the carriers insurance. Where replacement parts are sent, we will not usually require the return of the faulty/damaged part(s) but these must be retained by the customer until acceptance of the replacement part(s). We cannot accept claims for damage if they have been damaged after delivery. It is essential that any damage on delivery is reported to us PRIOR TO ASSEMBLY. We will be unable to accept claims for damage or returns for units that have already been assembled unless the unit proves to be faulty. If Products are refused at the point of delivery due to damage, faults or incorrect Products supplied then there will be no charge for carriage return which will be borne by us. If however, the delivery is refused and returned to us for any other reason then it will be assumed that you have consented to pay the carriage forwarding charge of £25 per item and this will be deducted from any refund due. If, on inspection, the Products are not found to be faulty/damaged or incorrect then the refund will be subject to the carriage forwarding charge detailed above and this will be deducted from the refund. Please remember that, where applicable, you are responsible for the safe keeping of Products until they are collected by our agents and you must ensure that, where appropriate, the Products are suitably re-packed prior to collection. This web site was created to provide information and products relating to GE Little Radiator Covers & Wine Racks to its customers. Access to any information shall not be deemed to give rise to any commitment or obligation on our part. Access to this web site is solely for legitimate business purposes to access the information provided by us. Any access or attempt to access other areas of our web site computer system or other information contained on the system for any purposes is strictly prohibited. The pages within this web site, static or dynamic, are never considered finished nor complete. We reserve the right to alter pages within this site without any prior notice. In particular we reserve the right to change prices listed without notice. Prices are correct at the time of order only and relate to Internet purchases only. All orders for products are subject to availability and we reserve the right to refuse to supply any particular person. Any changes to the policy will be posted on the web site. We have tried to ensure that the information provided on this web site is accurate. We make no representation and give no warranty, however, in respect of that information, which may contain technical inaccuracies or typographical errors. We do not accept liability for any loss (direct, indirect or consequential) howsoever arising for any such inaccuracies, errors or omissions except in relation to death or personal injury caused by our negligence. Every care has been taken to ensure that the description and specifications are correct at the time of going to press. However, while the colour/position of design reproduction is a close representation, a slight variation in the actual Products may occur. Care should be taken not to rely on the colour/shade of a product from pictures reproduced on the internet or printed from PDF brochures as the colours/shades viewed will vary between monitors and printers depending on the settings, resolution etc. In addition, for wood products it should be borne in mind that wood is a natural product and therefore there will always be variation in the grain and shade of all such products. All specifications, drawings, graphics and descriptions contained within this web site are intended merely to give a general description and any person reading them may not rely on anything therein as being a representation of fact or a warranty relating to the quality of the Products or of being fit for a particular purpose. Due to the nature of the site and the potential for errors in the storage and transmission of information we accept no responsibility for any reliance placed on the web site or for any reliance placed upon the information contained on any web site accessed through this web site. We make no representations or warranties, express or implied, about the accuracy, completeness, satisfactory quality or suitability for any purpose of the information in or contents of this web site. We expressly exclude to the fullest extent permitted by law any loss or damage incurred, directly or indirectly, from inaccuracies contained within this web site. We make no warranties that the said information is free of infection by computer viruses or other contamination. We accept no responsibility for unauthorised access or unauthorised actions and their consequences to the user. Users of this web site must be satisfied that he or she has the authorisation to access this web site and the full use of this web site. We do not advocate the violation of any laws connected to the use of this web site. We use a secure server that implements WORLDPAY Secure Server to protect your credit card information. However the security of information and payments transmitted by the internet cannot be guaranteed and we accept no responsibility for any losses incurred or sustained by customers who transmit information via this web site and/or by e-mail. If using a public computer please remember to sign out when you have finished. The information contained within this web site was created in a manner which is thought to be compatible with most browsers. The appearance of the site is therefore dependent on the software you are using and is such outside our control. We accept no responsibility for losses or damages resulting from any errors occurring in relation to your browser. We use a feature called a "cookie." Cookies, if accepted, are stored on a browser's hard drive and will assign a unique identification to your computer. You can still access the web site if you decline the cookie. 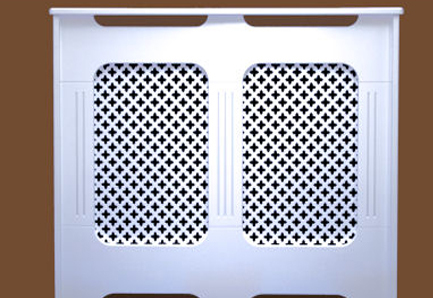 If you send ideas, remarks, questions, data, graphics or the like ("the Submissions") to us, these will become the exclusive property of GE Little Radiator Covers & Wine Racks. The Submissions will be deemed to be nonconfidential and we will be entitled to use or disclose the Submissions in any manner whatsoever, without liability or notice to you. The Submissions or any other information you send to this web site should not be, or contain, material which is offensive, pornographic, defamatory, blasphemous, unlawful or likely to infringe any applicable law, whether civil, criminal or religious. You agree that all material submitted to us is original to you, and not copied in whole or part from any third party. Please do not send anything which is required to be kept confidential. We are not responsible for any off-site pages or any other sites linked to this web site nor have we reviewed any such site. If you link to any off-site pages or other sites without our prior written permission, such action will be at your own risk. We cannot be held responsible for the contents of any web site which is electronically linked to this web site and which is not maintained by us. We collect personal information from you during registration and ordering as well as the cookie technology described above.